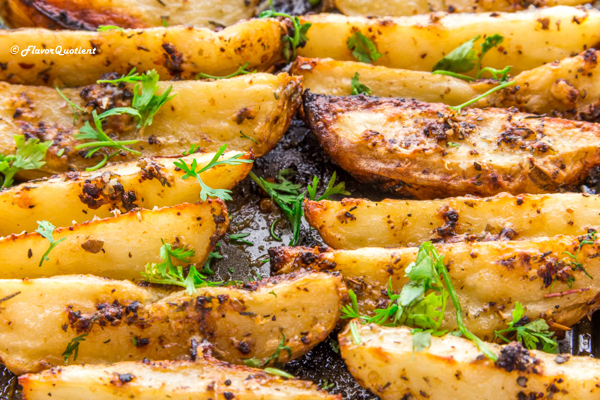 These crispy and flavor-packed baked potatoes are one of its kind! Trust me, you will never have enough of these – so make sure to make a biiiiiig batch! Roasted or baked potatoes are a rage. It is that kind of food which you can never have enough. I was aware of the situation which is why I used only 2 potatoes for making this as I knew, no matter how much I make, it will be vanished in a jiffy and I will regret later for gulping down too much of potatoes! What a sympathetic situation! If you are one of those lucky ones who can eat anything without worrying much, then by all means, make a double batch or even better, triple batch of this recipe and enjoy to your heart’s content. These are simply so good that you will come back later to thank me, I am sure! Bangalore weather is playing tricks with us – one day it’s so sunny that I almost forget about monsoon and then the very next day we shiver in the chilly wind after a heavy downpour. All these tricks result into heavy heads and runny nose of mine. It is during these time that I look for simple foods like these baked potatoes served with a warm plate of dal-rice, the perfect comfort food but with less prep and high flavor. The only prep you would be required to do for this is to wash the potatoes and cut them into wedges. You don’t even need to peel them – the skin adds an extra edge to the crispiness which you will realize once you take the very first bite. Serve these babies as a side with the roasted chicken thighs and you have the best meal of the day, sorted! 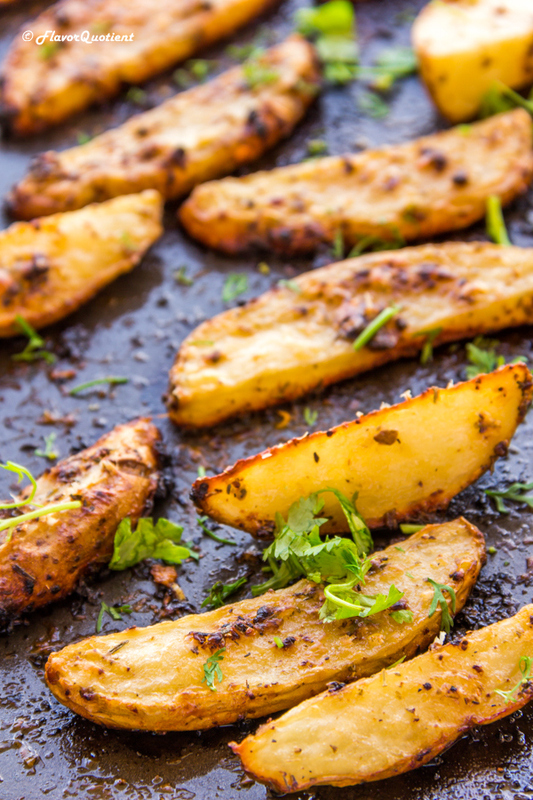 The Indian spiced roasted potatoes which I had shared a while back were completely different by the way – don’t mix them up. Other than being incredibly delish, they do not have anything in common. Today’s baked potatoes are flavored with Italian seasoning with the perfect combination of Parmesan cheese and this is a match made in heaven! Not that the Indian roasted potatoes is any less, but both of the are champions in different domain! Yeah, you get what I mean! These Italian spiced baked potatoes are best served on its own on a rainy night or as a side with your perfect roasted meat on summary BBQ day out – choice is yours! We love them throughout the year and anytime of the day as the skin-on potatoes, when roasted, attain some magical heights in terms of taste. I am sure you would also never get over it! Wash the potatoes thoroughly as we won’t peel them. So make sure to remove all the dirt from the skin. Cut the potatoes into thin long edges. Wash them to get rid of some starch. Pat them dry using a kitchen towel. Preheat your oven to 190 C / 375 F. lightly coat a baking sheet with little olive oil. Place the potatoes on a large bowl and add the olive oil. Toss to coat the potatoes all over. In another small bowl, mix together salt, Italian seasoning and garlic powder. Sprinkle this mixture over the potatoes and toss them again. Drizzle the shredded parmesan cheese over the potatoes and mix well. 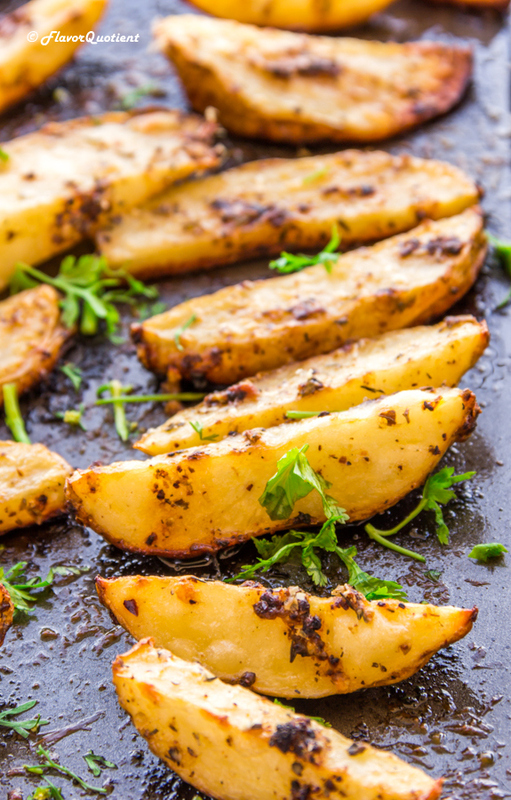 Place the potato wedges on the prepared baking sheet in a single layer. Try to keep the skin side down if possible. 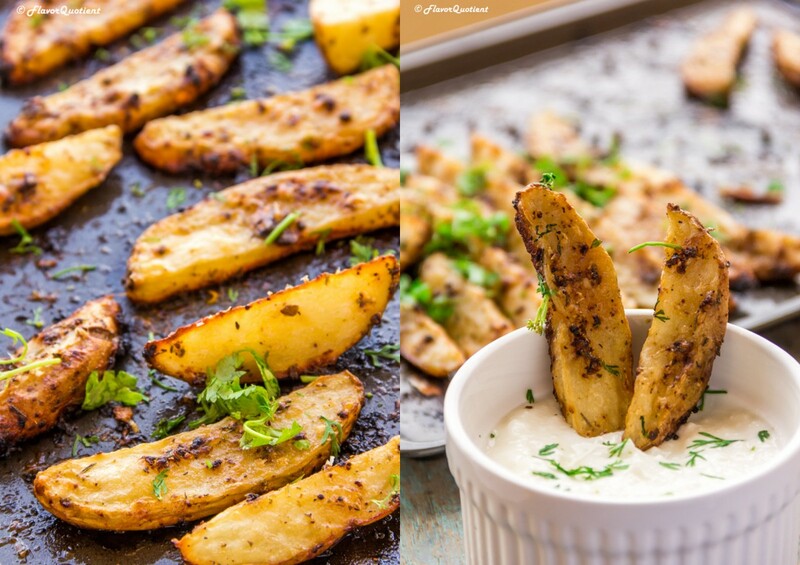 Bake the potato wedges for about 30 to 35 minutes until potatoes are tender but crispy and golden brown. Sprinkle with fresh coriander leaves or parsley and serve hot with your favorite yogurt or ranch dip. Sure! Let me know how it turned out!